Whynnie was intent on chicken nesting or broodiness and wanted to hatch out the eggs. 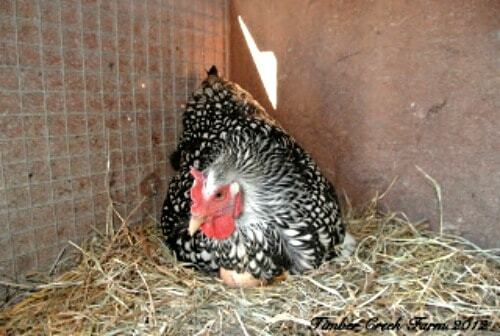 This was my first time dealing with a broody hen, who was following nature’s call to chicken nesting. 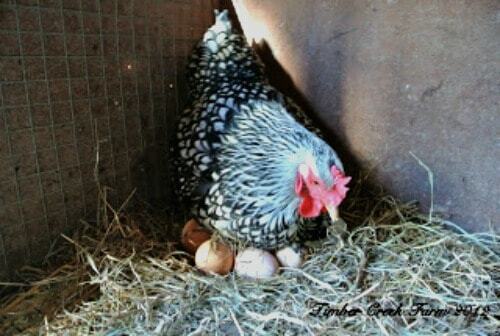 “One day I stopped to watch one of my hens gather up a clutch of eggs to sit on. It was interesting to watch as she methodically pulled each egg under her body using her feet and beak. Quiet determination at its best. I was so glad I had my camera with me. This is one of our Silver Laced Wyandotte hens.” When I first published these photos on the blog a few years ago, I was amazed that Whynnie went about her chicken nesting while I was standing there. 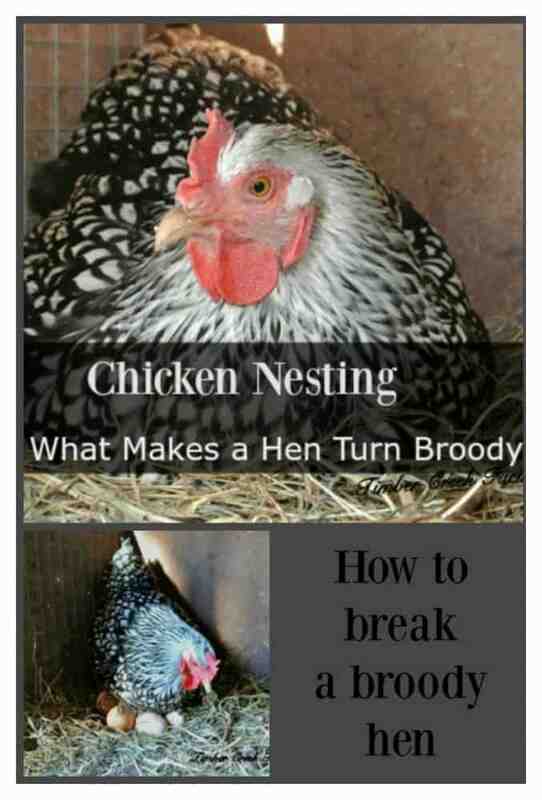 But broody behavior is a strong urge for a hen and I guess she had to do what she had to do. What makes some hens broody and other’s never have a thought about sitting on a nest? The hormones that kick in when egg laying begins causes some hens to seek motherhood immediately, while other’s never have this urge. Breaking the hen of the broody behavior may be necessary in some instances. 2. You don’t have a rooster, so the eggs are not fertilized. 3. 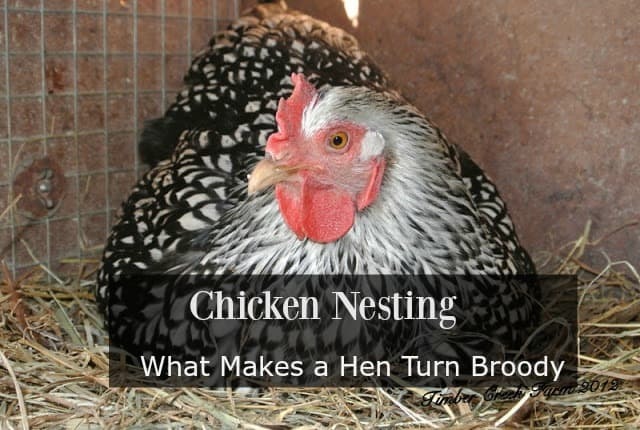 The hen is not healthy enough to go through a broody phase without further health decline. Some hens are not easy keepers, don’t keep weight on well, or have other issues. Setting on eggs for three weeks, only getting up once or twice a day, will lead to further health deterioration. 4. You want or need the eggs for food and do not want the chicken sitting on them. Also, while your hen is setting on eggs, she will not be laying any eggs. 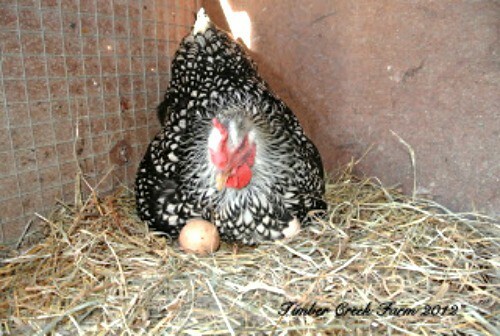 Some breeds are more inclined to broodiness and chicken nesting than others. Cochins, Brahmas, Orpingtons and Silkie’s have all been reported as being more likely to be broody than other breeds. In my flock, the Black Australorps are the most likely to be interested in chicken nesting. In the case of Whynnie’s attempt at chicken nesting, I did not want anymore chicks at that point. So I had to break her of the chicken nesting, broody urge. only one egg peeking out! I took her off the nest of eggs and picked them up, removing them from the coop. The next day, Whynnie tried again. She continued to try chicken nesting for several days, and each day I picked her up and insisted she go out to play with everyone else. Finally, her urge to brood passed. Her life returned to “normal”. The other hens were happy they could go into the nest without Whynnie getting upset. During warm weather, some people will give the hen a cool shallow bath to sit in for a few minutes. 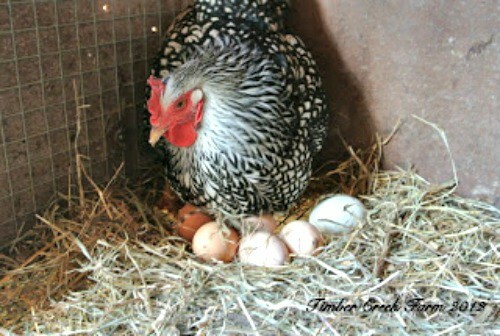 Whynnie was insistent that it was her time to attempt chicken nesting. She is still part of our flock and has never had another spell of persistent broodiness. Awww how cute! She is a beauty. We had a golden laced wyandotte and she was gorgeous, too. But I do love the silver! Thank you Lisa Lynn. I will go to the site and link up. Appreciate the opportunity! Thanks so much for sharing on The HomeAcre Hop!!! Thanks Lisa Lynn. I enjoyed your hop and will be hoping with you again! She is so cute. Thanks so much for sharing with Wednesday’s Adorned From Above Blog Hop. Have a great week. I have one that’s trying to be broody in the winter time. Much harder to break her because I can’t take her out of the nest and take her outside to “play”…it’s dark when we get home and past their bedtime. I take her out of the nest and put her on the roost. She stays there, at least until I’m gone. But I don’t know if she goes right back in the nest overnight. I’ve also taken the golf balls I usually have in the nests out so that after I’ve collected the eggs, there’s not a fake “egg” still there in any of the nests. 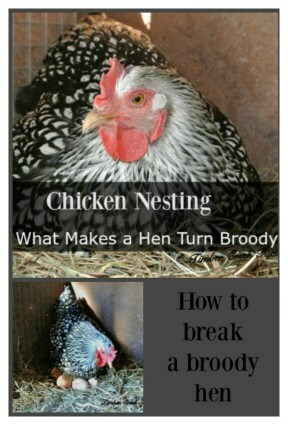 Thank you for the post, I’m new to keeping chickens and I have had one brooding. I wasn’t sure if eggs were fertile or not my roster is only 5 months old so I left her. Then the smell got so bad from the eggs I had to get her and the eggs out of the coop, it was so bad the other chickens would not even go up at night.